1. What is Apple Developer’s Certificate? This certificate is needed if you want to submit your app to the App Store under your own developer account. The Apple Developer's Certificate lets you submit apps to be published in the App Store. A .p12 file contains your developers certificate. 3. How to get it? 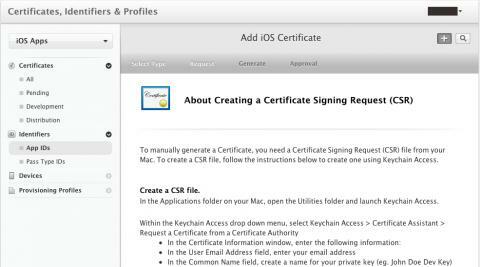 Login to your Apple Developer account and go to the ‘Certificates’ page. Follow the prompts to request a certificate from the certificate authority. Import and download the file. In the file, select both certificate and private key lines. Right -click and select ‘Export 2 Items’. The output is your .p12 file. Save it to your hard drive.